Record Store Day Releases 2018 Our Picks. 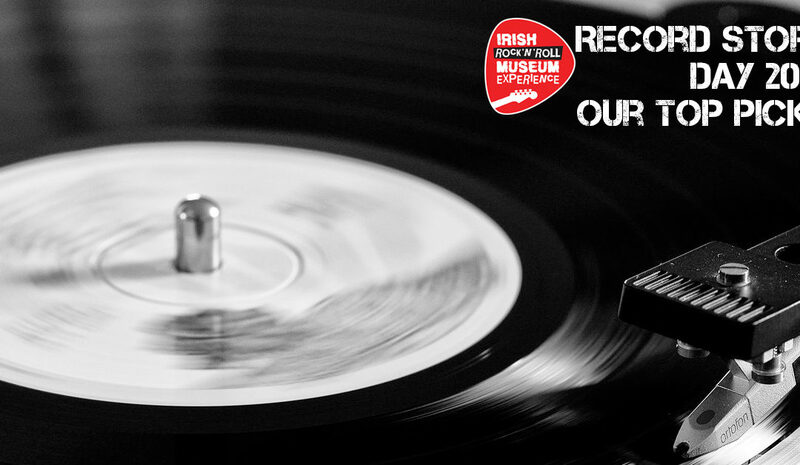 We’re big fans of vinyl here at the Museum, not that we really need to tell you, you can see that from our vinyl collection below, which is actually the largest on display record collection in Ireland. You can also see us wax lyrical about how we think vinyl just sounds better here. Don’t get us wrong, we still listen to Spotify and stream online but there’s something about sinking into the couch and listening to your favourite album that is epitomised by the crackle of our favourite record on a player. Now, this year we’re delighted that Record Store Day 2018 has some great releases and has been taken on board by lots of musicians so we’ve compiled a list of records we wouldn’t mind picking up for you below. Led Zeppelin are kicking off their 50th year in business by joining Record Store Day with two releases, both produced by Jimmy Page and previously unreleased to the public. Tom Waits Orphans: Brawlers, Bawlers & Bastards. Tom Waits is rereleasing the three piece entitled Orphans: Brawlers, Bawlers & Bastards, originally released in 2006. These were previously only sold as Orphans, but now they’re available for the first time as stand alone albums pressed on 2 xLP 180 transparent grey vinyl. All three are available to buy so pick one up or three! ‘It’s A Beautiful World’ which will be released exclusively for Record Store Day 2018 on Saturday 21st April. An alternate version of Van Morrison’s landmark album, featuring alternate versions and takes of the albums’ 10 songs. Celebrating the 40th anniversary of the ‘Teenage Kicks’ single (1978), and including all 13 of the classic era singles and hits. Original single artwork replicated and masters cut from original analogue tapes. U2 release their Record Store Day exclusive 12” Picture Disc for 2018, containing three versions of ‘Lights of Home’ taken from their fourteenth studio album Songs Of Experience released last December. Hear the new Beck Remix of (Lights of Home /Free Yourself) exclusively for the first time anywhere. It was a concert held at Zardi’s Jazzland in Hollywood on February 2, 1956 to celebrate the singer’s signing to Verve Records, which led to her catapult to fame. While it was released last year on CD this record store day is the first day it’s being released on vinyl. Snow Patrol are releasing a special Record Store Day 10″ record which is a 100% recycled product in commemoration of International World Earth Day 2018. World Earth Day Falls a day after RSD 2018. This Quadruple LP Vinyl will be released for first time on LP Vinyl for 2018 Record Store Day. We’re very excited about this one, Rory Gallagher’s estate is releasing The French Connection on vinyl for Record Store Day. It was recorded in Paris, France 1974 for RTL French Radio. It also features the cover artwork of student Glen Matthews. Glen is an independent Irish artist who the estate found on instagram here. You can also see him below, donating number 6 of the print used for the cover below to our Museum. A sound man altogether! Now this list is in absolutely no way an inclusive celebration of the great music released in support of small local music shops so if you think we’re missing anything do tell us. Also, support your local store like RAGE or SpinDizzy or Golden Disc or Tower Records and pop in tomorrow and buy locally. 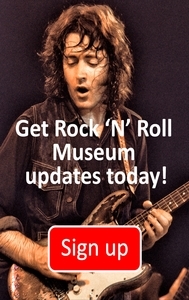 If you’re still in a mood to celebrate music then book in to take one of our tours today, and take your own picture with the best Rory Gallagher Memorabilia we can claim to date. And with a release tomorrow we can safely say rock and roll will never die.